In seven games since an October loss to Seattle, Carson Palmer has thrown 13 touchdown passes and four interceptions in leading the Cardinals to a 6-1 record. TEMPE, Ariz. — There is a 60 percent chance of rain with a high temperature of 46 expected in Seattle on Sunday. That seems fitting since the Seahawks have portended bad news for the Cardinals in their past two meetings. 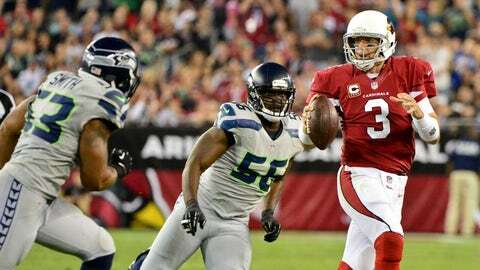 The Cardinals opened the 2012 season with a 20-16 win over the Seahawks at University of Phoenix Stadium, sparking a 4-0 start. But the team hit rock bottom and sealed former coach Ken Whisenhunt’s fate when it lost 58-0 in Seattle late in the season, setting several humiliating franchise records while barely competing. When the Cardinals first faced the Seahawks this season on Oct. 17 in Glendale, they were still muddling through a new offense and new personnel, not to mention a short week of practice for that Thursday night game — right after they had played the physical San Francisco 49ers. Seattle won 34-22, intercepting Carson Palmer twice and sacking him seven times while taking a 31-13 lead after three quarters. That’s when the calls to replace Palmer hit a crescendo. Since the Thursday night loss to the Seahawks, the Cardinals are 6-1 and Palmer has completed 69 percent of his passes for 1,948 yards, 13 TDs, four interceptions and a 106 passer rating. The Cardinals are hot and in the playoff hunt. Now here comes Seattle again, the NFL’s best team and one that hasn’t lost a game at CenturyLink Field the past two seasons (14 straight wins). How far have the Cardinals come? When asked if he would show his team the tape of last season’s 58-0 loss, Arians shook his head. The Cardinals know that if they lose at Seattle and both the Carolina Panthers and San Francisco 49ers win their games, they are eliminated from playoff contention.